Add attachments: users can attach different file types with Time Reports from local file, Weblink, Library or WebDAV document. 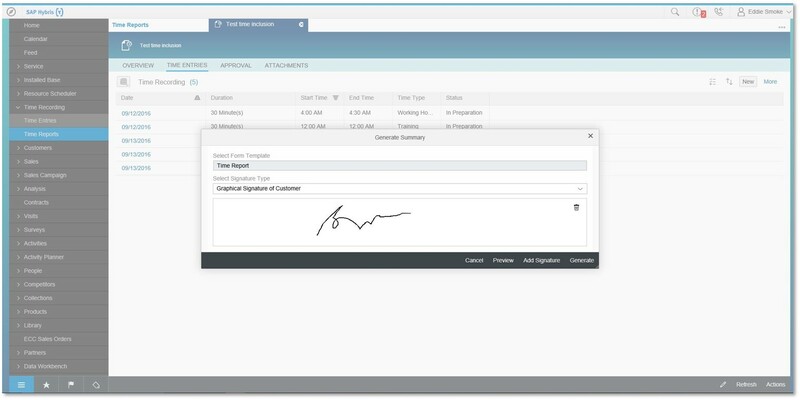 Capture Signature: Users can now capture different types of signatures for the time reports such as Customer, Service Technician etc. BADI for creating time items: A new feature is introduced where the customers can implement BADI during creation of Time Item from Time Entry to modify or copy information using custom logic/implementation. e.g. If customers would like to copy notes of the time entries into the ticket item’s internal notes they can implement the BADI accordingly. How can I capture different types of signatures? What is this feature about and is there a tutorial how to use it? I’m just trying to learn how Time Reports work. Neil Walker – Official site and academician’s blog.